We are pleased to debut a new Q Vision analytical tool for those focused on Floating Wind Energy. 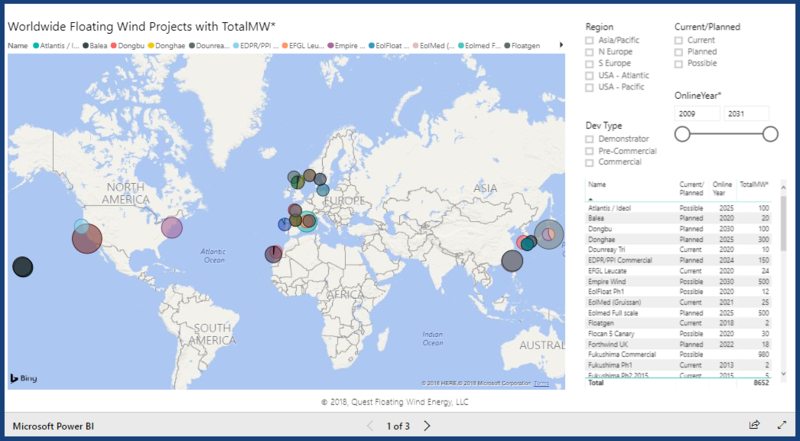 Worldwide Floating Wind Projects with Total MW is the first in a series of Microsoft Power BI “front ends” which allows the user to interrogate the new Q Vision system, the world’s most comprehensive Floating Wind Energy database. Look for new Q Vision analytical tools focused across the spectrum of the global supply chain including Floating Units Installed, Costs, LCoE, Cabling Arrays, Tonnage and Moorings in the near future.